Portland, Oregon's 'City of Roses', is home to numerous parks and gardens, including the spreading Washington Park and its famous Japanese Garden. 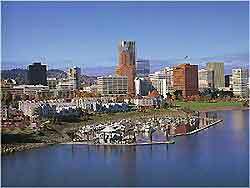 Divided into east and west regions by the Willamette River, Portland is a relaxed city with many diverse and historic areas. Major tourism districts in the city include Chinatown, Old Town and the trendy Lloyd District, containing America's first major shopping mall. The Willamette River has understandably become an integral part of the city center and is spanned by no less than nine large bridges, meaning that wherever you are, it is simple to cross to the other side. Public transport in the city is easy to come by and includes the Portland streetcars and the Tri-Met MAX light-rail network, connecting the nearby airport to the northeast. The majority of the city's hotels tend to reside within the downtown district or in the Northeast area, close to the Lloyd district and the city's convention center. If you are searching for cheap motels, then take a drive along the Northeast Airport Way (I-205 junction 24) and you will find a good selection, while further budget lodging is to be found around the Freeway exits. For campers, Oxbow Park in nearby Gresham is a reliable choice and lies just a relatively short distance to the east. More information about Portland Hotels. Located within the Pioneer Courthouse Square is the popular Portland and Oregon Visitors Association, which comes with endless tourist information and even its own small cinema, where you can watch a short informative film about the city, past and present. Also sited here are offices for the Tri-Met light rail and buses, being a good place to buy tickets or pick up timetables. Portland has many major tourist attractions, including Oregon Zoo - an award-winning zoo full of exotic animals, which has become the largest in Oregon; the Tom McCall Waterfront Park - amongst most popular recreational areas in Portland, on the banks of Willamette River; the Oregon Historical Society (OHS) - offering a host of historic and cultural information about Oregon; the World Forestry Discovery Center - recently revamped at a cost of seven million dollars, with many exciting rides and exhibits; and Washington Park - an especially impressive park, containing the famous Japanese Garden, Hoyt Arboretum and rose gardens. Other popular attractions here include the Japanese American Historical Plaza - a unique and quite beautiful sculpture garden, on the northern side of Portland's Waterfront; the Pioneer Courthouse Square - a popular bricked plaza standing in the very heart of downtown, containing an amphitheater; Pittock Mansion - housing an extensive collection of antiquities and glorious landscaped gardens; and the Portland Building and Portlandia - famed for being the first major postmodern architectural building in the whole world, including the enormous Portlandia statue. 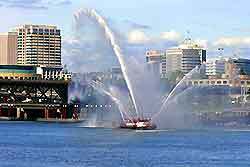 More information about Portland Tourist Attractions and Portland Landmarks. Portland is also home to innumerable museums and some of the most popular include the Oregon Museum of Science and Industry (OMSI) - one of the top ten science museums in the USA, with an IMAX theater and Planetarium; the Portland Children's Museum - an exciting blend of family fun and educational exhibits; the Oregon Jewish Museum - celebrating local Jewish art and history; the Oregon Maritime Center and Museum - located on an authentic sternwheeler tugboat and brimming with maritime exhibits; the Portland Art Museum - a truly spectacular museum, full of information about art from throughout the ages; and the Shaffer Fine Art - one of the finest art galleries in the city, housed within the George Lawrence building. 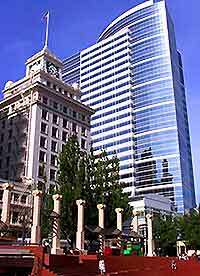 More information about Portland Museums and Portland Art Galleries. Tourist attractions located close to Portland include the Columbia River Gorge - a magnificent deep ravine with more than 70 waterfalls; the Government Island State Recreation Area - a scenic island to the northeast; the Lewis and Clark Recreation Site - a recreational picnic spot at the western entrance of the Columbia River Gorge; and Mount Hood - to the east of Portland, offering superb city views and nature trails. 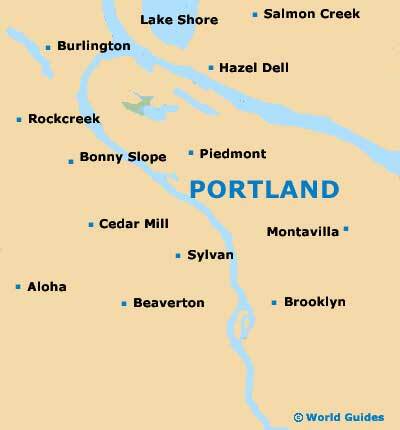 More information about Attractions Nearby Portland.